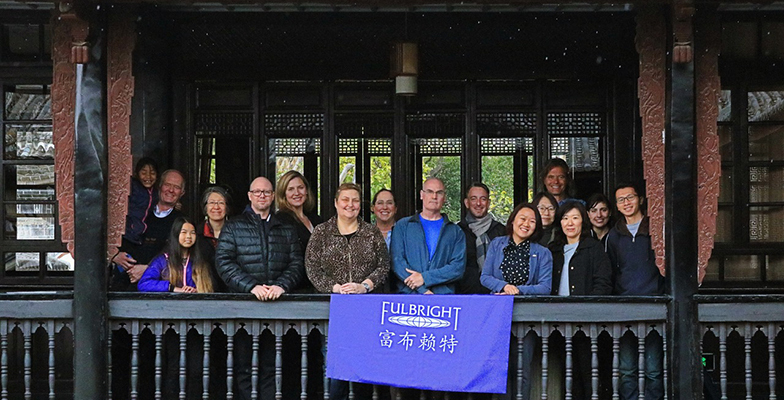 American University of Sharjah Associate Professor of Architecture Marcus Farr has officially begun his tenure as a Fulbright Scholar in China. As readers may know from an earlier post on this blog, we are following Marcus’ Fulbright expedition, giving our blog followers an insider’s view into what it is like to be a part of one of the world’s most prestigious and competitive fellowship programs. Marcus, a faculty member in the College of Architecture, Art and Design at AUS, joins a long list of highly talented academics who have taken part in the program since its launch in 1946 by US Senator, and later President, Harry S. Truman. As a form of cultural and public diplomacy, the program is intended to foster relationships between the USA and other countries, through the sharing of knowledge, research and learning. This aspect of the program has seen Marcus and his fellow Fulbright scholars in China embark on an intensive period of training. The group has spent nearly a week with the United States Ambassador to China, the United States Consul General to China, and other high-ranking diplomats, understanding the nuances of Chinese history and culture. In February, the group travelled to Dali in Yunnan Province, in the southwest of China. The city is a fitting place for Fulbright scholars to gain an appreciation of Chinese culture and history, having served as an early capital of China under the Nanzhao (738-937AD) and Dali (937-1253AD) Kingdoms, before eventually becoming an important outpost of the vast Mongol Kingdom of the 13th and 14th centuries. For Marcus, the old town area of the city holds particular interest, given his research into ancient Chinese building and architectural practices. The old area of Dali contains excellent examples of traditional Chinese building techniques, with the ancient town gates and Wuhua tower (originally built in the Nanzhao Kingdom, and then rebuilt during the Ming dynasty) able to be climbed by visitors. The city also contains a preserved house that once belonged to the Muslim leader of the Pathay Rebellion of 1856–1873, and which now serves as a museum. Following this intensive period of orientation, Marcus returned to his base in Tianjin, one of China’s largest cities, located on the coast, about an hour southeast of Beijing by train. It is here that Marcus will carry out much of his Fulbright research, and teach students at Tianjin University Graduate School of Architecture, one of the most prestigious architecture institutions in China. As explained in an earlier post, Marcus’ research will examine ancient Chinese architectural and building traditions, studying how historical techniques could inform modern-day practices as China undergoes a period of urbanization of unprecedented scale. Innovative architectural solutions will play a fundamental role in the success of China’s urbanization, allowing masses of people to live in relatively small spaces, sustainably and comfortably. Tianjin offers a great source of material for Marcus’ research, being the only city in China to have strong surviving examples of architecture from several different eras of foreign activity. The city was opened up as a trading port from the mid-1800s, seeing the British, French, Japanese, Germans and Russians establish concessions over a near 100-year period. Many of these concessions remain in quality condition, displaying the melding of traditional Chinese architecture with outside influences. Marcus has therefore been observing buildings in the concessions first-hand, through excursions to the concessions with his students, collecting primary evidence. He has also been studying old books, maps and drawings of the area, which provide insights into the city’s expansion and development. Such analysis will inform Marcus research and teaching, and provide new ways of looking at Chinese architecture in the modern world. For Marcus and his students, there is still a wealth of data to investigate. The stories of Tianjin’s buildings hold new information that could prove significant to China’s efforts to reduce poverty and elevate living standards through new architectural and building practices. As populations grow worldwide, and more of the earth’s population inhabits its cities, such practices will become increasingly important. Through the Fulbright program, Marcus hopes to contribute to this body of knowledge, and learn from the experiences of Tianjin. We will bring you more news of Marcus’ Fulbright journey, and the findings of his research over the coming weeks.